Ooo, I have been having so much fun with this project! 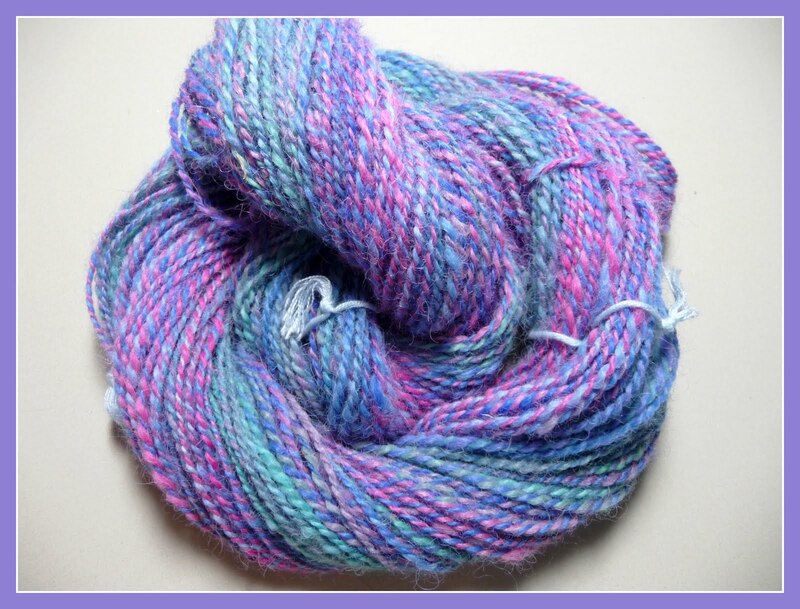 You may remember the ombre gradient fiber I dyed, pictured above. I spindle spun and wheel plied this yummy fiber. Before I spun it though, I mixed in some sparkle! Picture here in the pull skein, you can get a better feel for the color gradation. I ended up separating it into three pull skeins, light-med-dark, this is making it easier to show the gradation in my project. 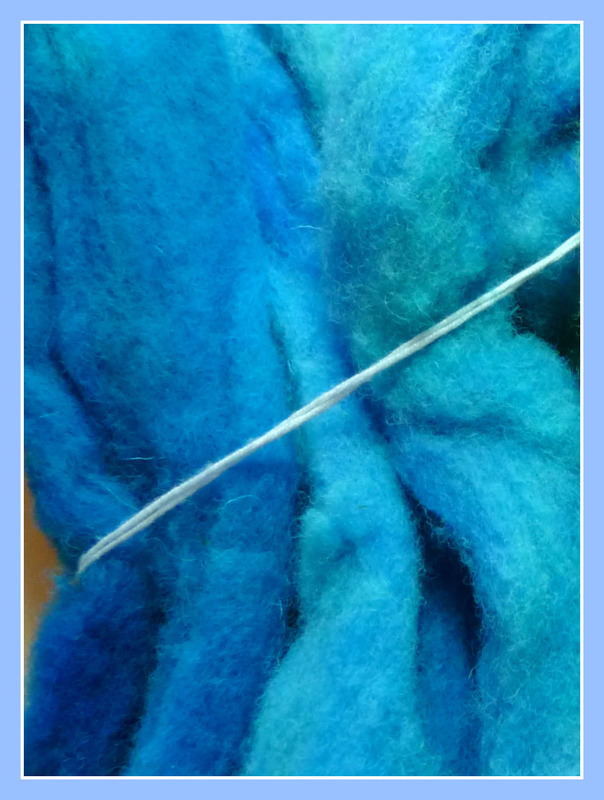 I decided to blend the two fibers I contributed to the project. 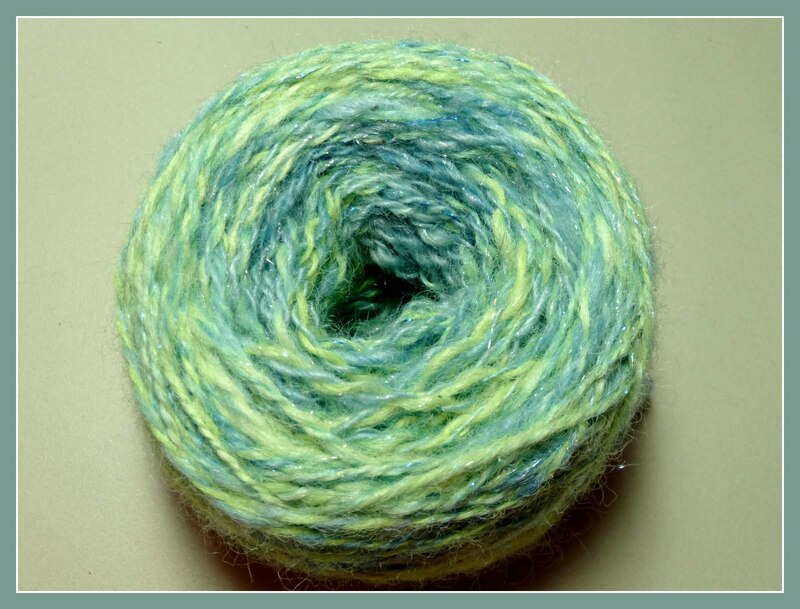 The blue is a mohair/fine wool blend and the chartreuse is alpaca. 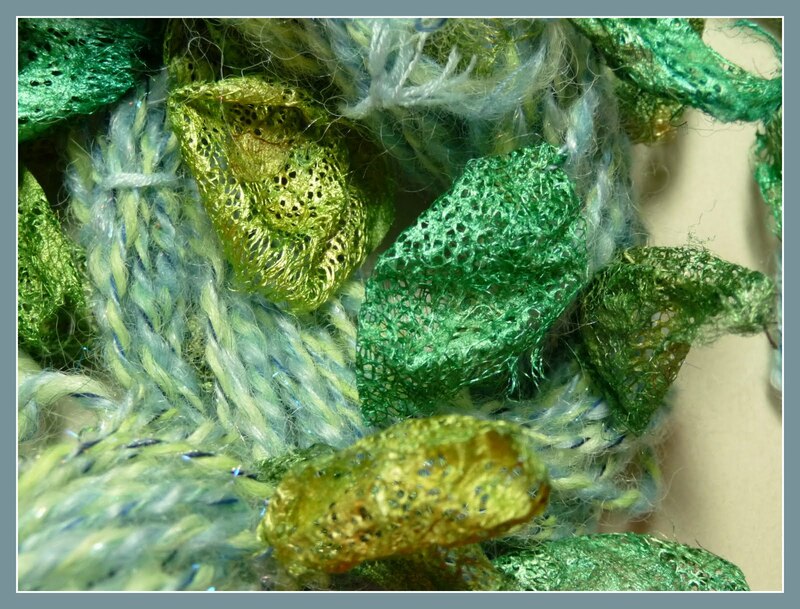 I used my home made hackle to blend the colors and of course I added in some sparkle! If you're interested in this blending process, there are tons of tutorials on youtube, search the term Fiber Blending Hackle. There are also a lot of directions available for making your own including this one which gives you all of the information on how to make and use one yourself, all in one spot. 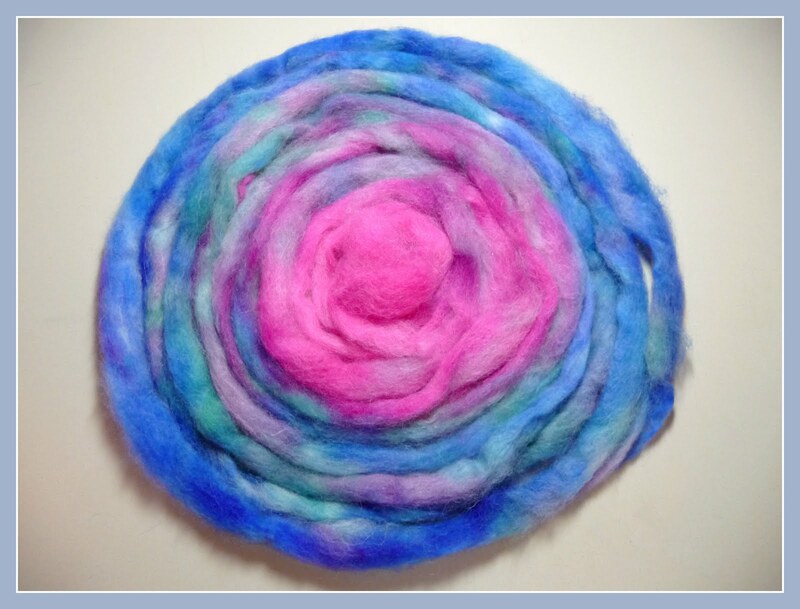 It's such a wonderful tool, nice for quick blending and it offers those of us without a drum carder the ability to blend our own artsy fiber mixes! I'm so pleased with the color combination and how it spun up. 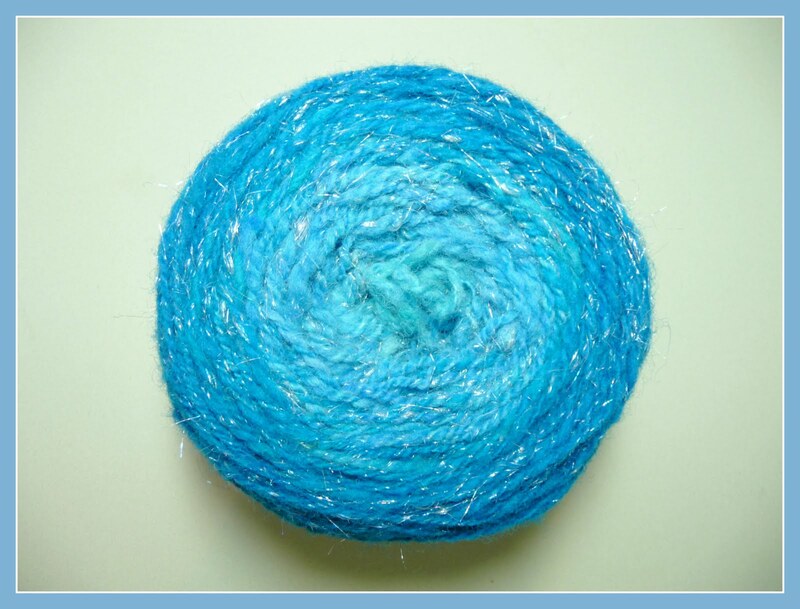 Using the same singles, I also plied a smaller skein with Indonesian Silk cocoons which I dyed in three different shades. I strung them onto a variegated denim cotton thread, looping each one in place, then I plied them all together. 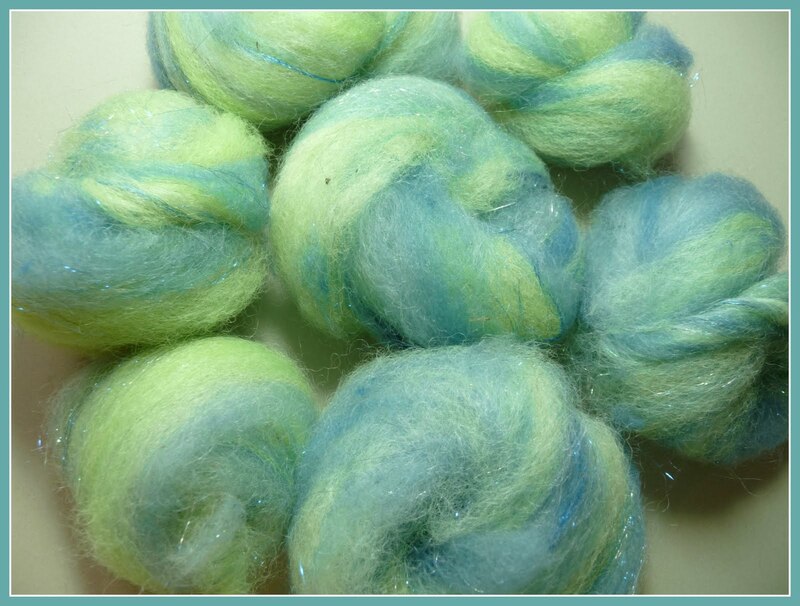 I had one remaining bundle of white fiber, which I'd set aside when I dyed the others. I was waiting to see if I needed a white in my mix or possibly another color. As you can see, I decided to dye it. I used a similar pallet with the blue-greens, but also added a new blue and of course some pink. Before I plied, I wound one of the singles onto a new bobbin so that they would ply together in the opposite color order. I love the colors! I'm sort of kicking myself now for not adding more colors to the other white roving(s) I dyed, you live, you learn! I hope you have a wonderful weekend, keep cool! I am so glad to see some one besides me having TOO MUCH FUN with this fiber exchange. It is great, love your yarns. Beautiful spinning...I love the addition of sparkles you gave the one yarn.